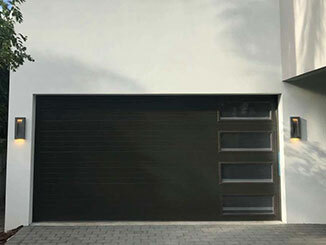 Modern garage doors come in a huge variety of different styles and materials. This makes it easier to find something that perfectly suits their needs, but it can be difficult to work out exactly what that is. There are so many options that it’s hard to know what’s right for you. We believe that a new door is an excellent investment, and we encourage our customers to carefully consider all their requirements before making a decision. The first thing we encourage you to think about is the material they need - sturdy steel, light and resilient aluminum, affordable plastic or classic timber? Weight: The heavier your door is, the stronger the opener will need to be. Stronger openers are inevitably more costly, so keep in mind that steel and wood doors (which are usually the heaviest) will attract an additional expense. Security: The stronger your door is, the harder it will be for thieves to break in. There are, of course, many other considerations to take into account, such as the quality of locks and other security measures. However, you should always bear in mind how well your door will resist a determined break-in attempt. Ease Of Maintenance: Different materials require different amounts of maintenance. Wood, for instance, must be regularly refinished to prevent water soaking in, and steel is vulnerable to rust. Aluminum doesn’t rust but it can corrode with time, while plastic is immune to corrosion and easy to clean. Which Materials Can I Choose From? The four main types of garage door material are plastic, aluminum, steel and wood. Some companies use more than one material at a time, and sometimes even include glass in their doors. However, the vast majority of doors will be constructed from these materials. Why Choose A Plastic Door? Plastic doors are affordable and come in a huge range of styles. They’re also very light, and don’t require a particularly strong opener. They aren’t as strong as other materials, though which can make them more vulnerable to damage. What About Aluminum And Steel Doors? The two types of metal used in garage doors both bring strength and resilience. While steel is the stronger of the two, it is also heavier - choose aluminum if you want a lighter door! There’s nothing quite as classy as a wooden garage door. They’re strong and tough, but bear in mind they’re also extremely heavy - a typical wooden door will weigh quite a lot more than the equivalent metal or plastic unit.